Gulmarg was first established as a ski resort by the British who had set up the Ski Club of India here in 1927. Skiing at Gulmarg had become very popular during the pre-independence years. The resort used to host two major skiing events, one each during Christmas and Easter. In 1938-39, about 500 skiers are said to have participated in Christmas and Easter ski races. 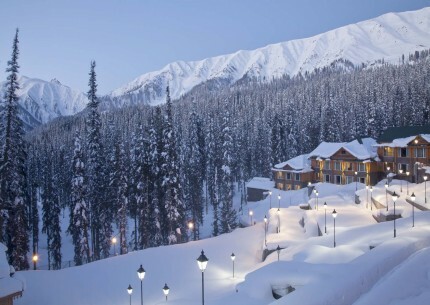 Gulmarg's atmosphere was identified with European ski resorts of the 1940's and 50's - the 'Alps of good old days'. It has good sunshine as well as good snow. The skiing season usually commences just before Christmas (mid December) and continues till ending March. During 1998, Gulmarg hosted the first National Winter Games of India, for which the facilities were enormously improved and upgraded. Modern equipment like Kasse Bohrer Snow Beating Machines (for preparing skiing slopes) and snowmobiles were imported, as also the first phase of the Gulmarg Gondola Cable Car was commissioned. The resort facilities were further improved and upgraded for the 4th National Winter Games, which were also held here during 2003-2004. Thereafter , every year national winter games are held at Gulmarg. 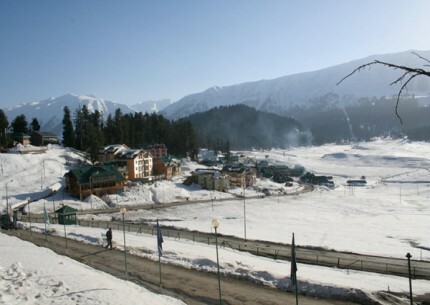 Winter Games Federation of India has declared Gulmarg as the Winter Games Capital of India. British discovered the hill resort of Gulmarg in 1927 during their colonial rule in India. Originally called 'Gaurimarg' by shepherds, its present name was given in the 16th century by Sultan Yusuf Shah, who was inspired by the sight of its grassy slopes emblazoned with wild flowers. Gulmarg was a favourite haunt of Emperor Jehangir who once collected 21 different varieties of flowers from here. Today Gulmarg is not merely a mountain resort of exceptional beauty- it also has the highest green golf course in the world, and is the country's premier ski resort in the winter. The little paradise can be reached by moving about 6 kms from the Gulmarg bus station. The green meadow is carpeted with flowers of all colours in the springs and in the winter it changes in to a dream destination for the skiing lovers and para gliders. The peaks are in clear view from the skiing slopes and they provides a beautiful background to the amusement. The 600 meters slope seen many tourists coming to the place for a wild adventure. Another beauty of it is that the famed Nanga Parbat is of height 7,100 meters is close to it on the south east and gives a perfect scenic photograph. 8 km from Gulmarg, is the famous shrine of noted Muslim saint, Baba Payam-ud-Din RA (AD 1475) who belonged to a noble family fromSrinagar.Baba renounced the world and became the disciple of Shiek Noor-ud-Din Noorani. One of the holy shrines of the Muslims, the dargah can bereached easily from Gulmarg or Tangmarg. The Ziarat basically a tomb of a well known saint who passed away from this very place in the year 1480. The famous saint was a courtier to the Kashmir King Zain -ul-Abidin before taking the path of renouncing the worldly ties. Visited by thousand of devotees, the shrine is seen in full activities with people of all religion offering prayers. 3.5km from Tangmarg, a motorable road leads to this famous picnic spot. A day trip from Gulmarg can be made far enjoying at the Ferozepur nallah ‘river’. Once a Tax collectionpoint whilepassing into the Valley, ‘Drang’ has now became a favorite tourist spot among visitors who enjoy a get-together over lunch along the riverside. 32km, is the famous stopover enroute to Gulmarg. Connecting Gulmarg by a 13 km metal road and an exciting 5 km trekking route. During Winters, warm clothes, long boots and water proofs are available on hire. The protected reserve area is situated at a distance of 48 km from Srinagar to its south west. It is well known for some of the best preserved rare species and even few endangered ones that include the musk deer. The reserves also boasts a rich avi -fauna population those that can be seen in the winter days when the migratory ones flockthe reserve from the hotter regions. The nearest airport to Gulmarg is in Badgam district. The Jammu railway station is the closest in the vicinity. Gulmarg is 56 kms from Srinagar. Jammu & Kashmir SRTC operates regular deluxe and ordinary bus services from Srinagar. In winter, the buses operate up to Tangmarg (11 kms from Gulmarg), the remaining distance being covered with smaller vehicles. Tourist taxis also operate between Srinagar and Gulmarg. About 15,000 sq. kms. in area, Kargil district has an agrarian population of approximately 120,000 people, who cultivate the land, along the course of the drainage system, wherever artificial irrigation from mountain streams is possible. About 85 % are Muslims, mainly of the Shia sect, Islam having been introduced to the original Buddhist population around the middle of the 16th century by missionaries from Kashmir and Central Asia. Their descendants, locally titledAgha, are mostly religious scholars who continue to hold sway over the population, even as the age-old traditions of Buddhist and animistic origin are discernible in the culture. Many elements of the ancient supernatural belief systems, especially many traditions connected with agricultural practices, are still followed with subdued reverence. Two small, turquoise, high altitude lakes with camping sites, and views of the surrounding permafrost mountains are the highlights of the Penzi La pass, which is 160 Km from Kargil and at an altitude of 4,401 to 4,450 meters, the highest point on the Kargil – Zanskar road. This pass is more of a table land and, unlike the Zojila, has plenty of flat spaces and things to see, the Drang-Drung, for instance. Kishtwar is behind the mountains of the right.Zanskar being half way through the pass, some 35 km, after Rangdum. It is spread over more than 5,000 Sq.Km. Zanskar remains cut off from the rest of the world for more than eight months a year due to blockade of the Penzi La. Besides there are no air service. Today Zanskar is one of the least interfered with microcosms of Ladakh and one of the last surviving cultural settlers of Tibet. Put simply, systems such as polyandry, which are more or less extinct in Leh town and in the more advanced villages of Leh district, still survive in some pockets of Zanskar. In 1999 around a quarter of Zanskar still practiced polyandry. Tucked away inside the picturesque upper part of the Wakha Valley, upstreams of Mulbek, Rgyal gives the appearance of a medieval settlement of cave dwellings transported in to the modern times with some improvements and extensions. The houses, neatly white-washed and closely stacked, are dug into the sheer face of a vertical cliff that rises high above the green valley bottom. From a far the village looks like a colony of beehives hanging from the ochre granite of the Cliffside. Phugthal is the most spectacularly located monastic establishment anywhere in Ladakh. The Phugthal complex spills out of the mouth of a huge cave high up in the sheer mountain face of a lateral gorge through which a major tributary of the Lungnak River flows. Perhaps the most isolated monastery in Zanskar, its foundation dates back to the early 12th century. The monastery has frescos and ceiling decorations reflecting strong Indian artistic and oceanographic influence. Rangdum( 3,657 meters, 130 km from Kargil town, 65 Km from Panikhar ). The Rangdum monastery has tiny & ldquo; museum & rdquo; with interesting Tibetan and other artifacts. Around forty monks live in the gompa. It is difficult to agree with accounts that date the Gompa to the 8th century. 18th century is more likely. The villagers who live near the Gompa are basically the agriculture shrifts of the monastery, a guidebook informs us. This monastery is built in a spectacular cave, lies on the Padum-Kishtwar trekking route, just before the ascent to the Omasi-La Pass begins. Situated like a swallow's nest on the rock face of the Ating Gorge, the monastery is associated with Naropa, a famous India Yogi. The two caves around which the present monastery has developed are said to have been used by Naropa for solitary mediation. The frescos on the cave walls are very old and reflect a high degree of artistic achievement. Situated 45 kms East of Kargil on the road to Leh, Mulbek (3230 m) in an area dominated by the Buddhists. It is situated along either banks of the Wakha River, which originates. Many Monuments of the early Buddhists era dot the landscape and are accessible from the road. Another picturesque village of the Wakha River valley, Shergol is situated across the river, right of the KargilLeh road. The main attraction is a cave monastery which is visible from a far as a white speck against the vertically rising ochre hill from which it appears to hang out. Below this small monastery is a larger Buddhist nunnery with about a dozen incumbents. 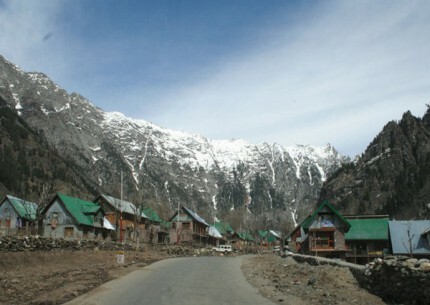 The village is accessible by the motorable road that branches off from the Kargil-Leh road, about 5 km short of Mulbek. Shergol is a convenient base for an exciting 4-day trek across the mountain range into the Suru valley. It is also the approach base for visiting Urgyan-Dzong, a meditation retreat lying deep inside the mountains surrounding the Wakha River valley. This meditation retreat lies tucked away in an amazing natural mountain fortress high up in Zanskar range. Concealed within is a circular table land with a small monastic establishment at its centre. The surrounding hillside reveals several caves where high-ranking Buddhists saints meditated in seclusion. At least one such cave is associated with the visit of Padmasambhava, the patron saint of Tibetan Buddhism. The main approach is to footpath laid through the only gap available in the rocky ramparts. Kargil, the headquarter of Kargil district, is around 204 Kms. to the east of Srinagar and 234 Kms. to the west of Leh.It was a transit point of caravans on their way to and from China, Tibet, Yarken and Kashmir till 1949, but since 1974 with the influx of tourists the region has been replaced as centre for tourism related activities. Tourists traveling between Zangskar, Leh and Srinagar have to make a night halt here, before starting for the second day of their journey. Drass is around 60 Kms. to the west of Kargil on the road to Srinagar. The place has beautiful pasture grounds and majestic mountain peaks surrounding it. Drass is the second coldest inhabited place in the world, where the temperature goes as low as - 50 in winter. Drass has become famous in recent years because of Pakistan’s misadventure in the Tiger hill and Tolloling areas. One can have a lovely view of Tiger hill from Drass village. Kargil does not have an airport, and the nearest airport is Srinagar, at a distance of 151 kms from Kargil. Kargil does not have a train station, and the nearest station is Jammu, at a distance of 255 kms from Kargil. Regular buses are available from Kargil and the state road transport of Jammu and Kashmir offers bus services that ply between Srinagar and Kargil and some local buses like the mini coaches also opens another options for travel. Moreover, to reach Kargil one can take cars or jeeps for road transportation. Katra or Katra Vaishno Devi, as it is popularly known, is a small town in Jammu and Kashmir, India, situated in the foothills of the Trikuta Mountains, where the holy shrine of Mata Vaishno Devi is located. It is part of the Udhampur District and is located 42 km from the city of Jammu. A pilgrimage to the Holy Shrine of Shri Mata Vaishno Devi Ji is considered to be one of the holiest pilgrimages of our times. Popular the world over as Moonh Maangi Muradein Poori Karne Wali Mata, which means, the Mother who fulfills whatever Her children wish for, Shri Mata Vaishno Devi Ji resides in a Holy Cave located in the folds of the three peaked mountain named Trikuta (pronounced as Trikoot). The Holy Cave attracts lakhs of devotees every year. In fact, the number of Yatris visiting the Holy Shrine annually now exceeds 5 million. This is due to the unflinching faith of the devotees who throng the Shrine from all parts of India and abroad. Regarded as one of the most revered Hindu pilgrimages, the Vaishno Devi Shrine is frequented by a large number of devotees every year to seek the blessings of Mother Goddess who resides in the cave. The Goddess here is worshipped in three forms -Maha Kali, Maha Saraswati and Mahalakshmi. Located just a km away from Katra, Jahan Kosha-a massive canon which is about 17.5ft long was built by Janardhan Karmakar, a 17th century craftsman from Dhaka. There is a lovely mosque which is believed to have the footprint of the revered prophet Hazrat Mohammad. A popular picnic spot, Baba Dhansar is situated at a distance of 10kms from Katra. Known for its picturesque setting with dense grove of trees, lovely spring dipping out of the mountainside, cluster of lovely watefalls, a naturally formed Shivling where one can really see water dipping naturally throughout the year make this place a pictorial delight. This place is also known for the huge fair that is held during Shivratri. Located at a distance of 30 kms from the town, Dera Baba Banda is one of the revered Hindu-Sikh pilgrimage centres. Baba Banda Bairaagi also known as the 'Saint Soldier' of Guru Gobind Singh. The Gurudwara built by Baba Bairaagi on the banks of river Chenaab is frequented by people of other faiths. 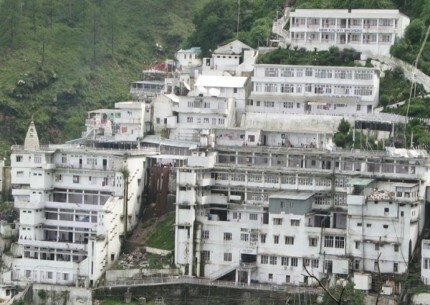 Aghar Jitto or the Shrine of Baba Jitto, a devotee of Maa Vaishno Devi is situated at a distance of 5km from the town. It is believed that if any pre- natal women take a dip in the holy spring water flowing in front of the shrine, safe delivery of baby is assured. Placed at a distance of 70km from the town, Shivkhori or the Holy Cave in the shape of the Damroo of Lord Shiva which is about half a kilometre long and has a 4feet high naturally formed Shiv-lingam right in the heart of the Sanctom Sanctorum. The most attractive feature of the cave is the sight of the natural milky water falling from the top of the Lingam signifying the eternity of the river Ganga. The Jammu Airport is the nearest airport located at a distance of 55kms from Katra. One can easily get several airline offices which provide regular flight service to Jammu. The Jammu Railway station located at a distance of 50kms is the nearest railway station from Katra. Jammu is easily accessible from any part of Indiaas it enjoys healthy rail network. The National Highway connects Katra with other parts of India. One can hire taxis which are easily available at Jammu and Katra. Famous for scenic beauty, the jewel of the Liddar valley, Pahalgam is situated in the western part of the state of Jammu and Kashmir. Set at 2130 m above sea level, surrounded by the great Himalayas, it is positioned on the banks of the Liddar River.The alpine weather conditions create pleasant and mild weather conditions in summers from April to June, while winters from November to February are cold and experience heavy snowfall. The rainy seasons of July and August see a huge entourage of pilgrims who come here to visit the holy cave of Amarnath, the abode of Lord Shiva, as Pahalgam is the starting point of the famous Amarnath Yatra.The mention of Pahalgam is found in the regions ruled by the Mughals in the medieval period. Local Hindu kings later ruled over it as a part of the Kingdom of Kashmir until this princely state annexed into India, after independence. The natural beauty of Pahalgam and the luxuriant Liddar valley attracts the tourists. There are number of picnic spots on the shores of River Liddar, flowing near Pahalgam. Pahalgam is also a part of Asia's only saffron growing area; the saffron plants are in full bloom in November. Pahalgam offers quite a few hiking and trekking trails, which one can explore riding on horseback. The snow capped peaks in the backdrop and lush green pine forests soothe the eyes of the travelers. The Liddar River is popular among travelers interested in angling and trout fishing. Virgin pine forests, clear mountain streams, and meadows of wildflowers mark Pahalgam as part of the paradisiacal beauty of Kashmir. Once you get to Pahalgam, there are several short walks from here and it is an ideal base for longer treks to Kolahoi Glacier. During the winter months (December to February) snow skiing is an attraction at Kolahoi glacier. Pahalgam is the point of commencement of the annual Amarnath pilgrimage. Tours to Pahalgam are associated mostly with the Amarnath pilgrimage. It is considered to be one of the most sacred places in the country. The Shiva-ling (phallic symbol of Lord Shiva) here changes its size as the moon waxes and wanes and with the season too. The ling stands at a height of about 6 feet on a full moon night. There is a celebration at the cave temple each year on the full moon day in July-August (Shravan) when the Shiva-ling attains its maximum height. It is believed that Lord Shiva materialized for the first time on this day. Amarnath is situated in a glacial valley 45 kilometers from Pahalgam at a height of 3888 meters. The cave is approximately 90 feet long and 150 feet high. According to a legend Lord Shiva narrated the secret of creation to Parvati here. Lord Shiva had been looking for a place where they wouldn’t be disturbed or overheard. He chose the Amarnath cave. When they started the journey he left Nandi (the bull he rides) behind at Pahalgam, which is also called Bail gaon. He liberated the moon from his hair (Jata) at Chandanwadi. He let the snakes off at the banks of Sheshnag. At Mahagunas Parvat (Mahaganesh hill) he chose to leave his son Ganesha. Shivji released the five elements, which make a living being behind at Panjtarni. Lord Shiva is believed to be the Lord of these elements. Lord Shiva and Mother Parvati did the Tandav to mark the sacrifice of the earthly world. Finally they came to the holy Amarnath cave. They were completely unaware that a pair of doves had overheard this conversation and since they discovered the secret of creation, they are reborn over and over again. The doves have made this cave their permanent dwelling. Several pilgrims have declared they have seen the pair of doves on their grueling trek up the path to the caves. If you visit Pahalgam, see if you can spot them! Mamaleshwara is only a km or so downstream from Pahalgam, and on the opposite side of the Lidder, is this small Shiva temple with its square, stone tank. It is thought to date from the reign of king Jayasima in the 12th century, even earlier. This meadow, about 5-km from Pahalgam and 150m higher, provides excellent views over the town and the Lidder valley. Pine forests and the snowclad mountains surround the grassy glen. One can hire ponies for this trek from near the centre of town. If one continues 11-km beyond Baisaran one reaches the Tulian Lake at 3,353m, 1,200m higher up. It is covered in ice for much of the year and surrounded by peaks, which rise more than 300m above its shores. It also can be reached by pony trek. The little village of Aru is actually the first stage from Pahalgam on the trek to Lidderwat and the Kolahoi glacier. It makes an interesting day walk from Pahalgam, following the Lidder river for Pahalgam, following the Lidder river for 11-km upstream. The main track, which also can be taken by car, is on the left bank of the river. There is also a less used, and more difficult path, on the right bank. At Aru one will often find the Gujars, living in their log huts with their flocks of sheep and goats, en route to the higher sheep and goats, en route to the higher pastures for the summer. Hajan Hajan, on the way to Chandanwari is an idyllic spot for a picnic. Filmgoers will recognize it instantly as it has been the location of several movie scenes. Chandanwari & Passage To The Amarnath Yatra Situated 16-km from Pahalgam, Chandanwari is the starting point of the Amarnath Yatra, which takes place every year in the month of Sawan (Rain). The destination is the Amarnath Cave, believed to the abode of Lord Shiva. Although the road from Pahalgam to Chandanwari is on fairly flat terrain, and can be undertaken by car, from Chandanwari onwards the track becomes much steeper, being accessible on foot or by pony. The state government makes extensive arrangements every year for the successful completion of the pilgrimage, registering each one of the over one lakh pilgrims, pony owners and Dandi Walas, providing camps en route, and ensuring safe, comfortable and speedy progress of the Yatris. Even if one's visit to Pahalgam is not during the period of the Yatra, one can still take a pony ride up to Sheshnag Lake, returning late evening. Fishing Pahalgam is one of Kashmir's popular trout fishing beats. Kashmir is famous for its trout although they tend to be rather small. Additionally, fishing licences are hard to get and rather expensive. A compulsion is to keep am guide and one is also permitted to catch six fishes, which is the daily limit. On The Road To Pahalgam The road to Pahalgam starts out towards Jammu but later branches off to the east at Anantnag. There are a number of points of interest along this route including several. indeed if one take a bus tour to Pahalgam one'll be thoroughly saturated with Mughal gardens by the time one arrives. Pampore Only 16-km out of Srinagar on the main highway south, Pampore is the Centre of Kashmir's saffron industry. Highly prized for it's flavouring and colouring properties and rather expensive, saffron is gathered from flowers, which are harvested in October. Avantipur, This popular stop on Pahalgam excursions is noted for its two ruined Hindu temples. The temples were both constructed by King Avantivarman, after whom this ancient centre was named, between 855 and 883 AD. The larger of the two is dedicated to Vishnu and known as the Avantiswami temple. A huge wall encloses the central shrine with four smaller shrines around the centre. The other temple dedicated to Lord Shiva and known as the Avantishvara, is about a km before the Vishnu temple, but also close to the main road. It is situated in a courtyard, enclosed by a massive stonewall with a gateway on the western side. The nearby village of Bijbihara has a huge Chinar tree, claimed to be the largest in Kashmir. Sangam, A little further down the road, Sangam is interesting for its strong local industry of cricket bat manufacturing! One'll see thousands of cricket bats displayed by the roadside and thousands more roughly cut lengths of wood being seasoned. Anantnag, At this point the road fords, one route turning northeast to Pahalgam and two others southeast to Achabal and Kokarnag or to Verinag. The Jammu road leaves this route just before Anantnag at Khanabal. Anantnag has a number of sulphur springs, esteemed for their curative properties. The largest spring is believed to be the home of Ananta, the serpent on which Lord Vishnu reclines and from which the town takes its name -'Abode of Ananta'. Ananta means 'endless' and the water issues from the base of a small hillock and rushes into another spring in the middle of which is a natural mineral deposit column which the locals revere as a lingam. On the 14th day of a full moon fortnight in September/October, there is a festival where the people fast and pour rice and milk into the spring to feed the goldfish. At one time Anantnag was known as Islamabad but this name is no longer used, due to the confusion it would cause with the not too far distant capital of Pakistan also named Islamabad. Achabal, The Mughal gardens in this small town were begun by Nur Jahan and completed by Jahanara, daughter of Shah Jahan, in 1640. It's one of the most carefully designed of the Kashmir gardens and was said to be a favourite retreat of Nur Jahan. Water from a copious spring flows from the garden in three stone lined canals, over three terraces and three cascades, with several fountains in the main canal. There are three pavilions on the upper terrace, shaded by Chinar Trees. There's a tourist bungalow, tourist huts and a camping ground at Achabal. Kokarnag. One may be suffering garden overload by the time one gets here, but Kokarnag has yet another one, noted for its roses. Like Achabal there is a tourist bungalow, tourist huts and a camping ground for accommodation. Somewhat above Kokarnag, along the bring river valley, there's the small hill resort of Daksum at 2,438m. 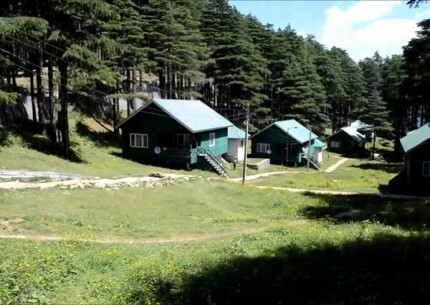 It's on the trekking route to Kishtwar and has a Rest house, Tourist Bungalow and plenty of camping spots. From Daksum the trail rises fairly steeply to the Sinthan Pass at 3,748m. The pass is open from April to September for trekkers. Only a few km beyond Anantnag, on the Pahalgam road, Mattan is an important Hindu pilgrimage point due to its fish filled springs. A complicated legend relates that the springs were created when Lord Shiva broke open an egg, which had been thrown there, the egg being the reincarnated form of a forgetful boy, who had been cursed by a wandering sage and that's only half the story! On a plateau above Mattan and 3-km to the south, stands the huge ruined temple of Martand. Built by Lalitaditya Mukhtapida it is the most impressive ancient ruin in Kashmir and beautifully sited. The ruins are 67m by 43m and consist of a portico with a small-detached shrine on both side and a quadrangular courtyard. The courtyard was surrounded by 84 columns - the multiple of the number of days in the week by the number of signs in the zodiac. From here to Pahalgam the road follows the course of the Lidder River, past some good trout fishing stretches. Close to the foot of the Pir Panjal range, the spring at Verinag is said to be the source of the Jhelum river, which flows north through Srinagar, Jehangir built an octagonal stone basin at the spring in 1612 and in 1620 his son, Shah Jahan, laid out a garden around it. The spring is said to be over 15m deep and is reputed never to dry up or overflow. There is also a tourist bungalow at Verinag. Nearest airport to Pahalgam is at Srinagar which is around 95 kms away. It takes around 3 hrs to cover this distance by bus. The closest rail head to Pahalgam is Jammu Tawi in Jammu. The distance between the two centers is approximately 275 km. To cover the distance, it takes at least 8 hrs of drive. State transport buses run to and fro from to Srinagar. Some private players also run their luxury and general coaches from Srinagar to Pahalga. Sonamarg or Sonmarg, located at a hefty altitude of 2,740 m above sea level, literally means 'Meadow of Gold'. The picturesque natural beauty of the region brought this name to Sonamarg. Sonamarg, a town surrounded by breathtaking glaciers and serene lakes, is a snow covered beautiful flower-laden meadow in the majestic Himalayan mountain region. Sonamarg in the Kashmir valley is the gateway to Ladakh and situated just before the Zojii La pass. Located at 87 km from Srinagar, the place is renowned for trekking and hiking trails. The snow clad peaks in the Himalaya and the undulated hilly mountainous regions are perfectly suitable for all types of trekking expeditions. Sonamarg is the base camp for many trekking expeditions. The major treks passing through various mountain lakes such as Gangabal, Vishansar, Gadsar, Satsar and Kishansar has its base at Sonamarg. The trekking routes offer all types of challenges, from mild to most hard. The pleasant climate with mild summer and cold winter make this place an ideal location for trekkers to explore the natural beauty and challenging treks. This enchanting scenic place is amazing with many mind blowing attractions. Nilagrad, a colony of the Baltics, is a picturesque location where a small stream splashes in to the River Sindh. Sonamarg is the home of many beautiful and serene lakes. Various mountain lakes such as Gangabal, Vishansar, Gadsar, Satsar and Kishansar are situated in and around Sonamarg. Vishansar, located at an amazing altitude of 4,084 m above sea level, is a scenic eye catching lake in Sonamarg. The crystal clear water of the lake with ice flakes all through is an appealing view from the top of the Sonamarg. The gorgeous views of this lake can be experienced from Nichnai Pass. Trekking freaks can get into their trek to this lake from Sonamarg. Krishnasar Lake, at a height of 3,801m above sea level, is popular for fishing especially for trout fishin. The nearest airport to Sonamarg is located at Srinagar, at a distance of 70 kms away. Srinagar is air connected to Delhi with regular flights. Taxis are available from airport to Sonamarg for a fare of about Rs 1000. Sonamarg does not have a train station, and the nearest station is Jammu, at a distance of 197 kms from Sonamarg. J&k SRTC operates regular deluxe and ordinary bus services to Gulmarg and Sonmarg from Srinagar. Srinagar is the largest city of Kashmir which is also the summer capital of Jammu and Kashmir and due to its qualities its also a center of attraction for tourists. Srinagar is spread over an area of 103.93 sq kms. and its height above sea level is 1730 meters. This is a beautiful tourist place with mixture of various castes, cultures and languages. The main specialty about this city are its waterfalls and gardens made by Mughal emperors which represent the beauty of 4th and 5th century. Various historians have different views about the establishment of Srinagar but to days truth is that Srinagar is surrounded on both the sides of Jhelum river. Mountains covered with snow, beautiful trees of Chinar, beautiful valleys ,world famous lakes like Nagina and Dull represents the view of this city. Due to its nice climate Srinagar attracts tourist throughout the year. Best Time To Visit - June To Early November & December To February. 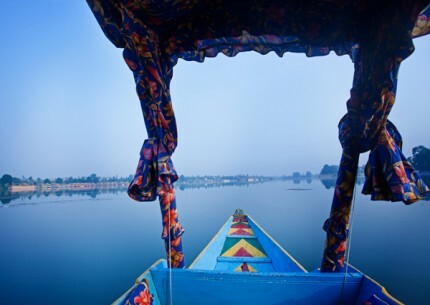 Dal Lake is the second largest lake in Kashmir Valley and forms the lifeline of the city of Kashmir. 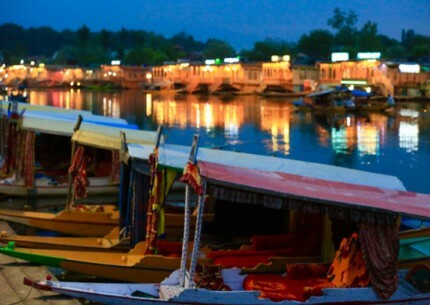 Often quoted as the "jewel of Kashmir” Dal Lake is a unique ecosystem and center of tourism activity in the state. It is flanked by Mughal Garden and Nishat Garden, built by Mughal Emperor Jahangir – the great nature lover and patron of art. Do not forget to spend a night in the house boats and a Shikara ride. 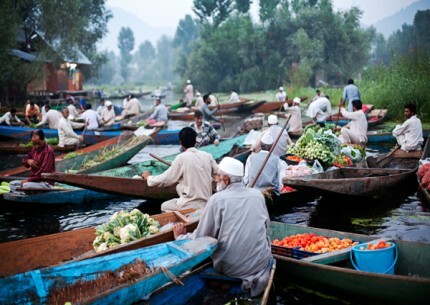 House boats and Shikaras along with the natural wetland flora forms the floating garden of Kashmir. 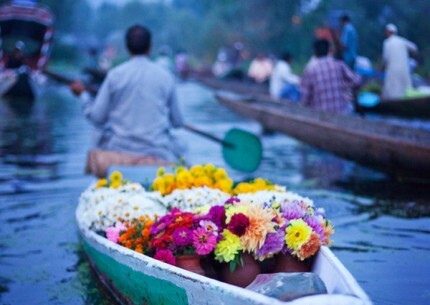 Time just flies by as you take a leisurely ride of the little decorated boats on the smooth surface of Dal lake, enjoying the view of the boulevards around and mountains in the horizon. With terraced lawns, cascading fountains, paint-box-bright flowerbeds with the panorama of the Dal in front of them - the three Mughal Gardens of Chesmashahi, Nishat and Shalimar are the Mughal Emperors' concept of paradise and are today very popular places for picnics and excursions. The beauty of these gardens is at their best during spring but the Mughal structure of these gardens lends them a unique sense of beauty even when the flowers are not blossoming. The Mughal garden in front of the Dal lake built by Emperor Jahangir. Chashmashahi is another beautiful Mughal garden. The white mosque is breathtakingly beautiful but be careful, as women can enter only the first part of the mosque. Also take a walk through the adjacent market area with a range of great fresh food and a thousand things deep fried. Ziarati Hazrati Youza Asouph in the Khanyar area, about 150 m NW of Dastgir Saheb mosque & shrine. This tomb, also known asRoza Bal, is believed by some to be the tomb of Jesus (part of the larger theory that he survived the crucifixion and made his way to Kashmir where he lived until at least the age of 100). It has been made popular by recent books such asJesus Lived in Indiaby Holger Kersten among others. It's down a little side road - ask around, pretty much anyone in the area can point you in the right direction. Is a Hindu temple dedicated to Lord Shiva on a hilltop. It can be reached by a car or taxi. No cameras or cellphones are allowed within the temple and you are supposed to leave them in the vehicle before entering the temple premises. Cigarattes, liquor are to be deposited with the police personnel before the ascent of the hill as these items are against Hindu religion. Pari Mahal:- Don't miss the breathtaking views of the city from here. Considered the largest fresh water lake in Asia, Wular Lake is a major tourist attraction in Kashmir. It is located around 33 Kilometers form Srinagar city. This Lake is a natural wetland fed by river Jhelum and acts as a natural flood control mechanism too. Surrounded by lofty snow capped mountains and coniferous trees it provides the perfect setting for a boat ride, stroll or trek which ever you prefer. Fish lover and Bird watchers are in for a delight. This area, along with the surrounding wetlands acts as a winter breeding and resting ground for migratory birds. Wular is house to a large no of resident birds and accounts for 60% of the state’s fish production. There is an old 15thcentury ruin on a man made lake at the center which was created by King Zain-ul-abidin. One of the holiest Muslim Shrines in India, Hazratbal or Assar-e-Sharief is is preserving a relic that many believe to be the hair of Prophet Mohammad. It is located on the left flank of Dal Lake and commands deep respect among believers. You won’t miss it if you are strolling around the lake or taking a lazy ride in the Shikaras. Most of the people do know about the famous philosopher Shankaracharya. The Shankaracharya Temple is situated approximately one thousand feet above the city. Reportedly, the shrine is situated in the top most part of Srinagar. It is one of the very important places to visit. There are many followers of philosopher Sankaracharya. They generally wish to visit the place. The temple is dedicated to Lord Shiva. Reportedly, the place existed from the dates back to 2,500 BC. According to history, the philosopher Shankaracharya stayed at this place in the time when he visited Kashmir. The personality visited Kashmir approx ten centuries ago and he came to revive "Sanatan Dharma”. Srinagar can be reached by air. Some of the major airlines like Indian Airlines and Jet Airways operate out of Srinagar Airport, connecting it to cities like Mumbai, Kolkata and Delhi. The closest railway station to Srinagar lies in Jammu. It is situated at Jammu Tawai. This is a main railhead for the region. It connects Srinagar to others cities like Delhi, Mumbai and Chandigarh. Srinagar is connected by a network of well maintained roads. 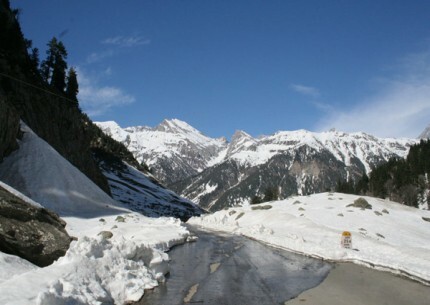 It can easily be accessed from Chandigarh, Gulmarg, Jammu, Sonamarg, Delhi and Pahalgam via road.